The program is recommended for all dental or hygiene students in all years of school, as well as faculty. Nearly one-third of dentists who retire early are forced to, due to an MSD. 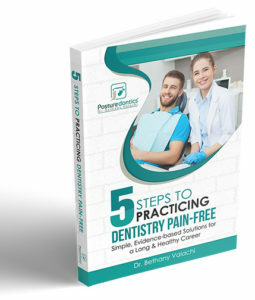 This problem usually starts in dental school–by their third year over 70% of dental students report pain. 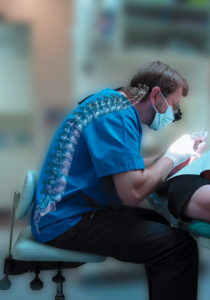 This 1/2 day lecture for students and faculty will fuse current research in dental ergonomics, biomechanics, kinesiology and anatomy to address the etiology of the most common musculoskeletal disorders in dentistry and prevention strategies. Recent research and clinical outcomes support new models for movement in the operatory, and equipment adjustment. The most prominent ergonomic problems in dental schools will be introduced, with associated interventions. Specific ergonomic challenges for each year: bench lab, sim lab and clinic will be introduced, with suggested modifications and interventions. Proper positioning of the patient, operator and overhead light for specific arches, quadrants and tooth surfaces. Selection criteria for delivery systems, stools and patient chairs based on their height, body size, gender or specialty. Postural awareness and seated biomechanics interactive exercises. Etiology of the most common musculoskeletal disorders in dentistry. In the afternoon, a hands-on practicum will provide students with the opportunity to reinforce and practice the lecture material. Students divide up into 2 or 3 groups and rotate into the clinic. Students chose partners and role-play the patient, then switch roles. Each session is 1 1/2 hours, providing each student with 45 minutes to practice various positioning exercises for various quadrants and tooth surfaces. Bethany provides demonstration and verbal instruction guiding students through the practicum. She will provide individual coaching to students as time allows, and faculty are also highly encouraged to interact and provide correction during the practicum. Contact Dr. Bethany Valachi to set up this specifically designed lecture for you and your dental associates.